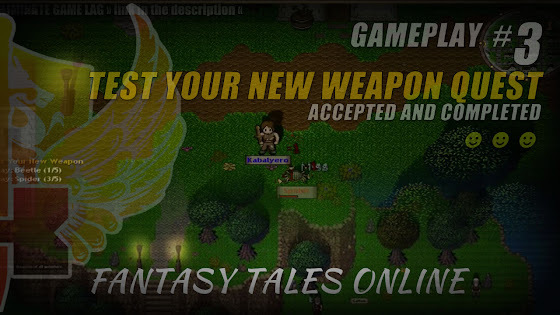 Test Your New Weapon Quest Accepted & Completed In Fantasy Tales Online - KABALYERO - PLAY, BLOG & EARN! Test Your New Weapon is a quest in Fantasy Tales Online. It's the second quest my character accepted and completed. He accepted it from Folmar, the NPC who runs the Weapon Store. After completing the very easy and simple quest from Hew, We Need Help, my character got a new quest from Folmar and it involved killing spiders and beetles. The quest, Test Your New Weapon, was a good way for my character to test his new weapon, Training Sword. It was also an opportunity to test and try my character's only skill which is Double Strike. ► There are many great MMORPGs from other countries. Don't let region blocking by publishers stop you from enjoying them. Use VyprVPN. This quest was a very easy quest to complete and my character completed it quickly. Killing 5 spiders and 5 beetles is hardly a challenge for my character's brand new Training Sword and Double Strike skill. LOL. The reward for this quest was 25 experience points and it was rewarded to my character after completing the quest and returning back to Folmar in Fantasy Tales Online.